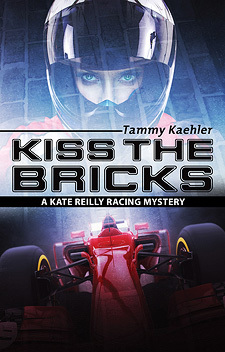 "Smooth, quick, and punchy, KISS THE BRICKS pulls readers into the high-octane drama of the Indianapolis 500. The racing feels authentic and intense, but what propels this novel is the compelling mystery." After the first practice session for the legendary Indianapolis 500 motor race, Kate Reilly is stunned to discover she was the fastest driver—but she's more surprised to learn she wasn't the first woman to top the speed charts in the race's 106-year history. That feat was accomplished in 1987 by PJ Rodriguez—who shocked everyone by committing suicide ten days later. When the press, bloggers, and social media go crazy over the connection, Kate loses her identity—suddenly everyone's comparing Kate and PJ, calling Kate PJ, and wondering if Kate will kill herself, too. Except that PJ's family claim PJ was murdered, and they want Kate's help finding her killer and restoring her reputation. Thirty years after the fact. Join the official fan club of Kate Reilly, professional racecar driver! Follow Kate on Twitter or sign up for the mailing list. Site design © & maintenance by xuni.com. All content © 2010-2019, Tammy Kaehler.